Home Java What is Java? Java is a general-purpose and object-oriented programming language which was developed by James Gosling, Patrick Naughton, Chris Warth, Ed Frank, and Mike Sheridan at Sun Microsystems, Inc. in 1991. It took 18 months to develop the first working version of Java. Java language was initially called "Oak" which was an Oak tree but was renamed "Java" in 1995. On January 27,2010 Sun was acquired by the Oracle Corporations for US$ 7.4 billion that's why nowadays we say Java is an Oracle product. Why Java language comes into the market? The Sun Microsystems Company made the software for electronic devices such as microwaves ovens and remote controls. As you can probably think, many different types of CPUs are used as controllers. The problem with C and C++ (and most other languages) is that they are designed to be compiled for a specific target. Although it is impossible to compile a C++ program for just about any type of CPU, to do so we require a full C++ compiler targeted for that CPU. The problem is that compilers are very much expensive and time-consuming to create. An easier and more cost-efficient solution was needed. In an attempt to find such a solution, Gosling and their team members began work on a portable, platform-independent language that could be used to produce code that would run on a variety of CPUs under the different environments. That's why Java language comes into the market. 2. Android: If you want to make an android app you need to learn Java because of Android applications are either written in Java or use Java APIs. 3. Big Data: In Big Data and Hadoop MapReduce framework written using Java. 4. Desktop Applications: Desktop applications such as netbeans, Avast Antivirus, media player etc. are made in Java language. 5. Web Applications: Web Applications such as javastudypoint.com, irctc.co.in etc. are made with the help of Servlet and JSP etc. 6. Apart from this, Java language also used in Embedded systems, Games, Smart Cards, Billing application etc. 1. Simple: Java was designed to be easy to learn and use effectively. Assuming that you have some programming experiences, you will not find Java hard to master. If you already understand the basics concept of object-oriented programming, learning Java will be even easier. 2. Object-Oriented: Java is based on Object-Oriented approach. Everything in Java treated like an object. All the operations in Java are performed using these objects. 3. Robust: Because Java is a strictly typed language, it checks your code at compile time. However, it also checks your code at runtime. This feature makes the Java program robust. 4. Multithreaded: Java was designed to meet the real world requirements of creating interactive, networked programs. To accomplish this, Java supports multithreaded programming, which allows the developers to construct interactive applications that can run smoothly. 5. Distributed: Java language is designed for the distributed environment of the network because it handles TCP/IP protocols. Java also supports Remote Method Invocation (RMI). This feature enables a program to invoke methods across the internet. 6. Platform-Independent: Unlike many other programming languages including C and C++, when Java program is compiled, it is not compiled into a platform-specific machine, rather than into platform-independent byte code. This byte code is distributed over the web and interpreted by the Java Virtual Machine (JVM) on whichever platform it is being run on. 7. Secure: When Java program is compiled it generates byte code which is the non-readable form and not readable by a human. With Java Secure feature we can develop virus-free, tamper-free systems. The three main components of Java Programming language are JVM, JDK, and JRE which stands for Java Virtual Machine, Java Development Kit, and Java Runtime Environment respectively. JVM (Java Virtual Machine) is an abstract machine that provides a runtime environment in which Java bytecode can be executed. JVM is a virtual machine because it doesn't physically exist. Whatever Java application you run using JRE or JDK goes into JVM and JVM is responsible for executing the java program line by line hence it is also known as an interpreter. JVM is also responsible for loads the code, verify the code, execute the code, and provides the runtime environment for run Java programs. The JRE (Java Runtime Enviournrmnt) provides the environment to run Java programs. JRE is used by the end user of your system. 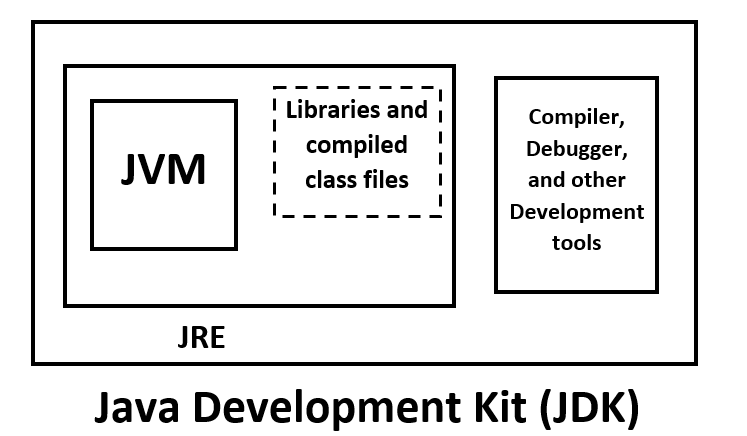 JRE consists of a set of libraries and other files that JVM uses at runtime. 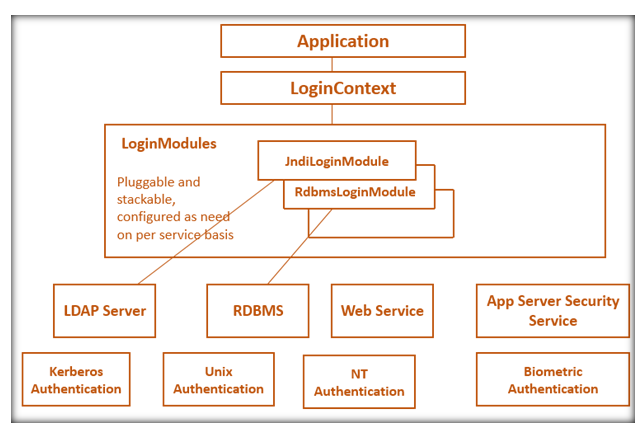 i) Development tools: Which is used to provide an environment to develop Java applications. ii) JRE: Which is used to execute Java applications. JRE provides the environment to run Java applications, In JRE JVM is responsible to run Java applications. JDK contains a compiler (javac), an archiver (jar), a documentation generator (Javadoc), etc. to complete the development of a Java Application.